The world likes stuffed cabbage. 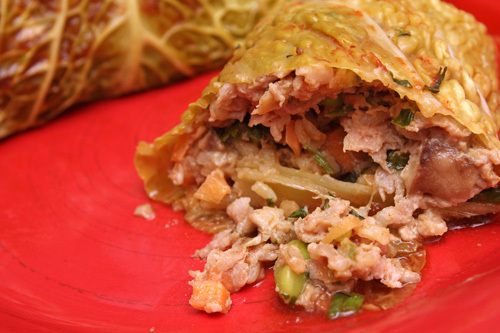 Southeastern Europeans will stuff pickled cabbage leaves with meat, spices, grains, and vegetables. Asians will include shiitake mushrooms in their Chinese cabbage rolls. The Swedes and the Finnish will sauce with lingonberry jam. Eastern Europe likes tomato-based sauces or sour cream. Lebanon likes yogurt and a minty vinaigrette. I tried the recipe for “Asian Cabbage Rolls,” from the February 2013 issue of Cuisine at Home (recipe below), using a tasty mix of pork, shiitakes, and edamame and saucing with a vinegary tomato mix. I did not pre-cook the cabbage leaves, but rather flattened the raw leaves with a rolling pin and cut off their hardest stem ends. The stuffing starts off raw here too; the raw rolls bake for 25 minutes. For the cabbage rolls, combine pork, mushrooms, 1 cup rice, edamame, cilantro, scallions, carrot, 2 Tbsp. + 2 tsp. soy sauce, 1 Tbsp. + 1 tsp. oil, garlic, 1 Tbsp. + 1 tsp. ginger, salt and smoked paprika. Roll cabbage leaves with a rolling pin until the stem side is flat, smooth, and pliable. Scoop more than 1/3 cup cup pork mixture onto the stem of each flattened leaf. Starting at the stem end, roll up each leaf, folding in the sides as you roll. Arrange each roll, seam side down, in a 3-quart baking dish. For the sauce, whisk together broth, vinegar, 1/3 cup soy sauce, tomato paste, 1 Tbsp. + 1 tsp. ginger, 1 Tbsp. + 1 tsp. oil, brown sugar, and cornstarch; pour over cabbage rolls in dish. Tightly cover dish with foil. Bake cabbage rolls until an instant read thermometer inserted into the center of the roll registers 160 degrees F, 30-35 minutes. Serve rolls with additional rice and drizzle with sauce. The initial rawness of all the ingredients was appealing to me here, as a somewhat lazy cook. I’d rather not take many cooking steps to get to my meal. Frozen, shelled edamame are easy to use, as is leftover cooked rice. The sauce is simply whisked and poured on raw, to also cook with the rolls. And the rolls cook quickly, too. I liked the tangy sauce: rice vinegar, soy sauce, ginger. I sprinkled red pepper flakes on the adult rolls. We all enjoyed these, as happy citizens of the world, eating our stuffed cabbage. Next time, I will showcase the “Sesame Turkey Cutlets with Israeli Couscous Pilaf,” from the February/March 2013 issue of Fine Cooking. Come back to my site soon, to see what happens.